Sledge Bros. (or Sledge Brothers) are large overweight versions of Hammer Bros. that throw sledge hammers instead of regular ones and they can create small earthquakes as well. 1.1.3 New Super Mario Bros. The Sledge Brothers first appeared in Super Mario Bros. 3, where they replace Hammer Brothers in the Giant Land levels, as well as on the area's map. If a Sledge Brother sees Mario or Luigi, it attacks them by throwing sledge hammers at them; additionally, whenever a Sledge Brother jumps and lands on the ground, it creates a miniature earthquake which can paralyze Mario. To defeat a Sledge Brother, Mario can either jump on it, hit it with a Shell, use a fireball as Fire Mario, or a hammer as Hammer Mario to take it out. Originally, their map icon was a Hammer Brother, but in the SNES remake in Super Mario All-Stars, their map icon changed into a green Hammer Brother. Their map icon was later changed to properly resemble a Sledge Brother in Super Mario Advance 4: Super Mario Bros. 3. In the artwork and sprites of Super Mario Bros. 3 and its re-releases, Sledge Bros. are depicted with mucus dripping out of their noses; however, this trait was not carried over into subsequent appearances (excluding Yoshi's Safari and their "classic" designs in Super Mario Maker). Preliminary sprite sheets for Super Mario World, in which two sprites of Sledge Bros. can be seen. Even though they are not featured in the final game, Sledge Bros. were initially supposed to appear in Super Mario World, as initial placeholder sprites were made for them, having been drawn over their Super Mario Bros. 3 sprites, but with shading and orange skin instead of green skin. However, they are not present in the final whatsoever, not even in unused graphics, meaning theirs had been overwritten during development. Sledge Bros. reappear in the eighth world of New Super Mario Bros. The Sledge Bros. of New Super Mario Bros. can be defeated by jumping on them, hitting them with a fireball as Fire Mario or by touching them when Mario is empowered by a Starman. Like the Fire Bros., they only appear in World 8-7. Unlike in Super Mario Bros. 3, they don't always cause earthquakes with their every jump; this only happens when they ground pound, which can also destroy brick blocks. This is needed to obtain a Star Coin. 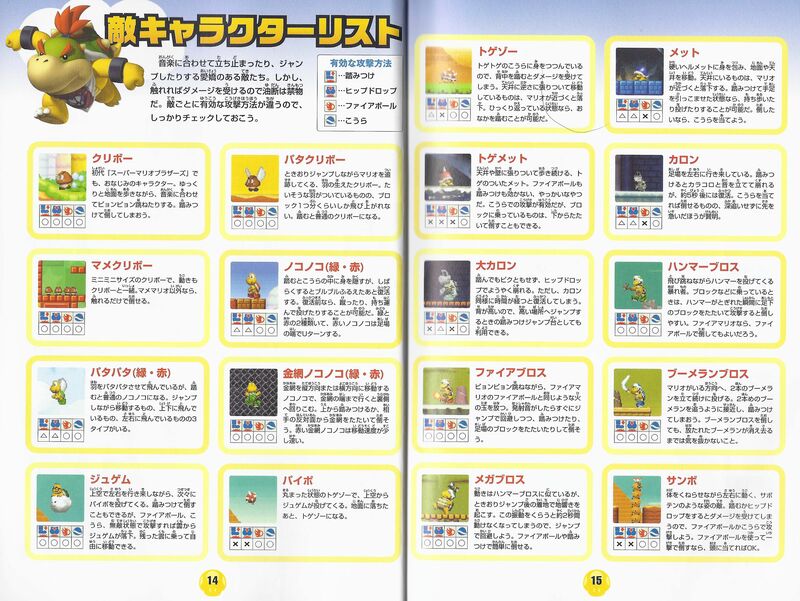 In the official strategy guide, Sledge Bros. are misnamed Sumo Bros., a name associated with an unrelated enemy from Super Mario World. Sledge Bros. reappear in the game New Super Mario Bros. Wii as rare enemies, along with Hammer Bros. They are first encountered in World 6-2, where a pair of Sledge Bros. guard the exit of the cave. They also appear as semi-common enemies in World 7- . Like in New Super Mario Bros., their jump and ground pound moves are separate, although they are no longer seen breaking stone blocks. The strategy guide and the respective trading card both mislabel them as Sumo Bros.
Sledge Bros., along with the Fire Bros. again, outnumbered the once common Hammer Bros. in this game, the former being in two levels while the latter only appears in one. If a Sledge Bro is frozen by an Ice Ball, the player must Ground Pound it to defeat it, as it is too heavy to pick up. When frozen, Sledge Bros. will always be standing, even if they were frozen when ground pounding. Sledge Bros. reappear in New Super Mario Bros. 2, acting just like they did in past games. However, only one exists in the main game, appearing in World 2-2. They also appear as common enemies in the third course of the Coin Challenge Pack A in Coin Rush. Several later appear in the first course for the Mystery Adventures Pack. While the effects of a Gold Ring are active, Sledge Bros. are unaffected physically, but still give coins when defeated. Sledge Bros. are once again mistakenly referred to as Sumo Bros in the guide. Sledge Bros. make a return in New Super Mario Bros. U, appearing only in the level, Ludwig's Clockwork Castle, which is found at Meringue Clouds. They work like they have in the previous games. Only three are seen in the game. As the actual Sumo Bros. appear in this game, the Prima guide no longer mistakes them for the other. Sledge Bros. also appear in New Super Luigi U, where they're encountered in the course, All Aboard!. Sledge Bros. return in Super Mario Maker and Super Mario Maker for Nintendo 3DS as enemies. They can be created by dragging a Super Mushroom on top of a Hammer Bro. They function the same as previous games. Because they did not originally appear in Super Mario Bros. and Super Mario World, brand new sprites in their respective art styles have been drawn. They can be given wings, which will make them float in the air briefly before they Ground Pound. They can be placed in Blocks, Bill Blasters, Warp Pipes, and placed on tracks. Unlike most enemies, they can not be increased in size by a Super Mushroom because Hammer Bros. need one to become a Sledge Bro. This also works as making it impossible to make Hammer Bros. bigger without them becoming Sledge Bros. All of the "classic" versions have the dripping nose present in old artwork. They also return in Super Mario Maker 2. Sledge Brothers make several appearances in The Adventures of Super Mario Bros. 3, where they are among the elite of King Koopa and the Koopalings' military forces. They are generally portrayed as fairly tough soldiers, and manage to pose as major enemies to Mario, Luigi, Princess Toadstool and Toad in many episodes. Much like in the game, Sledge Brothers are able to cause tremors by jumping. One exception is in the episode Never Koop a Koopa. A team of six Sledge Brothers, called the Hammers, appear as competitors in the International Mushroom Games in Leaping Lizards. The only one of them to have his named mentioned, Angus Boomer, appears to be their leader. They compete in all the events except the Super Triple Jump, since their stubby legs are only good for leaping vertically, not horizontally. 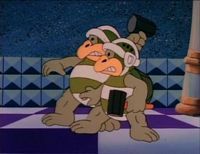 A pair of Sledge Brothers appear in Koopa Capers as members of Wendy O. Koopa's secret rebellion. When Luigi discovers the rebellion's camp in the Magma Pits, Wendy orders the Sledge Brothers to throw him into a boiling pool of water, but if Luigi whistles the correct tune, he makes them drowsy, and tricks one into leaving by asking for a pencil to leave a note for Mario as his last request. Luigi distracts the remaining Sledge Brother by pointing out how poorly a group of Koopa Troopas are doing a marching formation, and defeats him and his returning brother by knocking out some of the Koopa Troopas and kicking their shells at the two burly soldiers. In Yoshi's Safari, Sledge Brothers appear as mini-bosses who attack Mario and Yoshi by throwing sledge hammers at them; a Sledge Brother can also immobilize Mario and Yoshi by stomping the ground. A Sledge Brother must be hit multiple times with Mario's Super Scope to defeat it in Yoshi's Safari. 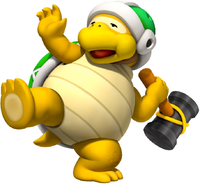 To avoid being hit, Mario can shoot the sledge hammers that the Sledge Brother throws, destroying them. In Mario Kart Wii, some Sledge Bros. can briefly be seen in some sections of the Daisy Circuit and on a ship in D.K. 's Jungle Parkway, along with other spectators. Sledge Bros. make their Mario Party debut in Mario Party 10, where a large Sledge Bro (known as "Mega Sledge Bro" in the North American version) appears as a boss. Its minigame, Sledge Bro's Card Chaos, involves cards and Bullet Bills. The players must remember the number of Bullet Bills on the cards, because the Sledge Bro hides them after a moment. After that, the players have to choose a card to launch a bullet on the Sledge Bro. The number of bullets is from one to three. Some cards can have hammers on them. The Sledge Bro will throw a hammer on the player who choose one of these cards. A Sledge Bro also occasionally appears as one of the selectable enemies at the second Gate Space of any given board in Bowser Party mode. Sledge Bros. appear as enemies in Puzzle & Dragons: Super Mario Bros. Edition. However, they are only really seen as the boss of World 7-11, along with ★World 7-11. Sledge Bros. are Dark attribute characters, and their skill changes all Light Orbs into Dark Orbs, while their Awoken Skill increases the amount of HP that gets restored whenever Heart Orbs are cleared. When fought as enemies, a Sledge Bro will often start a battle by using Dark Protection to defend itself against Dark attribute attacks. It also takes longer to attack than the other members of the Hammer Brother species, attacking every 3 turns. A player can get a Sledge Bro by using five Super Mushrooms to transform a Hammer Bro. Usual: "I can jump, too..." ~ "SLEDGE SMASH!" ~ "I'm feeling smashy!" ~ "Your hammer is puny!" A new variant of Sledge Bros. called Shady Sledge Bros. appear in Paper Mario: Color Splash. The first one is encountered in Dark Bloo Inn. The second and last one is encountered in Vortex Island. Normal Sledge Bros. also appear as enemies in Green Energy Plant and Black Bowser's Castle. Husks are replaced by Sledge Bros. in Minecraft's Super Mario Mash-Up Pack. Unlike most depictions, they have visible sclera in this game. Sledge Bros. appear as spectators in the Marina Stadium in Mario Tennis Aces, among Hammer Bros, Koopa Troopas, Penguins, Shy Guys and other species. 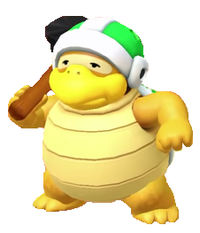 Sledge Bros. are large, overweight Hammer Bros. with yellow skin and belly plates, green shells and helmets, and big feet with three toes each. Unlike their smaller relatives, Sledge Bros. do not wear shoes, and their eyes are also smaller and beady; additionally, they carry around large sledge hammers instead of small clawed hammers. Sledge Bros. have more pronounced beaks than Hammer Bros. In Super Mario Bros. 3, Sledge Bros. had light green skin, white belly plates, and wore black shells and helmets, though this was likely due to the NES' technical limitations. The Super Mario All-Stars version of Super Mario Bros. 3 gives Sledge Bros. a darker green skin tone, as well as cream-colored belly plates. Sledge Bros. were also portrayed with mucus dripping from their nose, a detail later revisited in the Super Mario Bros., Super Mario Bros. 3, and Super Mario World styles in Super Mario Maker. The Super Mario Bros. style also gives Sledge Bros. smiles as opposed to their frowns, as well as "proper" eyes with irises. The Adventures of Super Mario Bros. 3 is mostly faithful to the game depiction of Sledge Bros, though their are several differences: Sledge Bros. are slightly less overweight and bulky, they lack the dripping mucus from their noses, and they wear dark green shells and helmets instead of black. Paper Mario: Color Splash is mostly faithful to Sledge Bro's current design, though he also has a paper outline in this game. Unlike Hammer Bros., Sledge Bros. specialize in physical strength, as shown by their ability to carry and throw sledge hammers with ease. Sledge Bros. still have the ability to jump, though they jump considerably lower than their smaller relatives. Unlike them, however, Sledge Bros. can Ground Pound to unleash small earthquakes or shockwaves to stun their adversaries. Sledge Bros. are portrayed as Dark-attribute enemies in Puzzle and Dragons: Super Mario Bros. Edition, since they can change all field orbs into Dark Orbs. Although Sledge Bros. can be easily defeated by a jump, the aforementioned game makes them more resilient, due to having high HP; this also goes for Paper Mario: Color Splash. Stomping Sledge Bro from New Super Mario Bros.
Italian Martellone Bros. Giant Hammer Bros.
1 - Their names are inconsistent throughout the dubbed version of the episode "Never Koop a Koopa". The generic moniker "Tovarăș" ("Fellow") replaces an instance of "Sledge Brother" from the English version (Eng. : "Whew! A Sledge Brother! "; Rom: "Uuu! Un Tovarăș!"). Other than that, Sledge Brothers are incorrectly referred to simply as Hammer Brothers. An ordinary Hammer Bro in the GBA version of Mario & Luigi: Superstar Saga resembles a Sledge Bro. ↑ Super Mario Bros. 3 English instruction booklet, page 41. ↑ New Super Mario Bros. 2 Prima eGuide, "Common Critters" tab. ↑ Super Mario Bros. 3 Japanese instruction booklet, page 42. This page was last edited on April 22, 2019, at 10:31.